Florence is still a Major Category 4 hurricane in the western Atlantic heading toward the U.S. East Coast over the next couple days. As of 8 AM AST, Florence had winds of 130 mph and was moving to the west-northwest at 17 mph. While this northwestward track will continue over the next 36 hours, we should start to see Florence quickly slow down as the system approaches the coast late Thursday into Friday, and even track southward as we head into the weekend. This is due to an area of high pressure across parts of the east-central United States. This slowing down of Florence will only prolong the system across the region, increasing the potential of life-threatening storm surge and catastrophic flash flooding across parts of the Mid-Atlantic States and the Carolina. Models have come into better alignment that this is what could unfold as we head into the weekend. Last minute track changes in a hurricane are not uncommon and a lot can change in the next 24-48 hours, which is why it’s important to keep monitoring the updates and stay alert. Damaging hurricane-force winds are also expected across parts of North and South Carolina. It is important to remember that significant impacts from Florence will occur far from the center of the storm, including further inland. If you are within the forecast cone, preparations should be made or rushed to completion over the next few days. FEMA officials are warning that today will be the last good day to evacuate. Numerous Storm Surge and Hurricane Watches and Warnings are in effect along and near the coast ahead of Florence. Florence isn’t the only storm we are tracking. 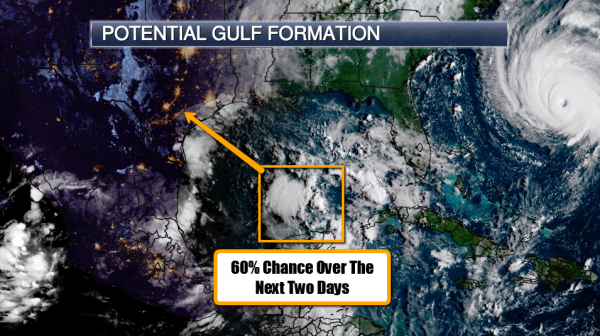 First, a tropical wave that has moved into the Gulf of Mexico has a 60% chance of becoming a tropical system in the next couple days as it moves toward the western Gulf Coast. Facilities across portions of northeastern Mexico, Texas, and Louisiana should continue to monitor this situation over the next few days. 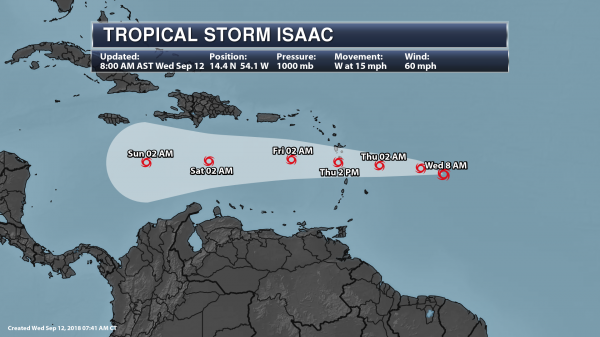 Tropical Storm Isaac is slowly weakening east of the Lesser Antilles. A westward track is expected to continue over the next several days with slow weakening, and this system will impact parts of the Lesser Antilles Thursday. Tropical Storm Watches and Warnings are in effect. Tropical Storm Olivia is impacting the Hawaiian Islands with rain and gusty winds this morning. 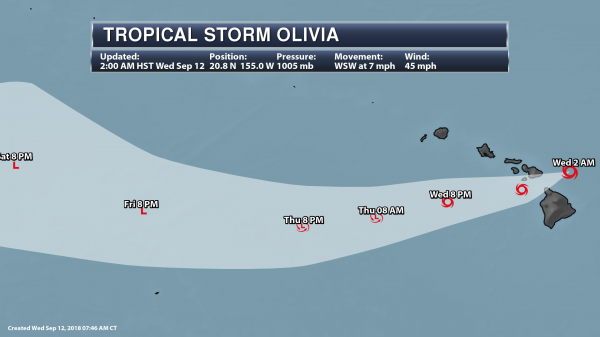 Olivia will pass over Hawaii throughout the day. 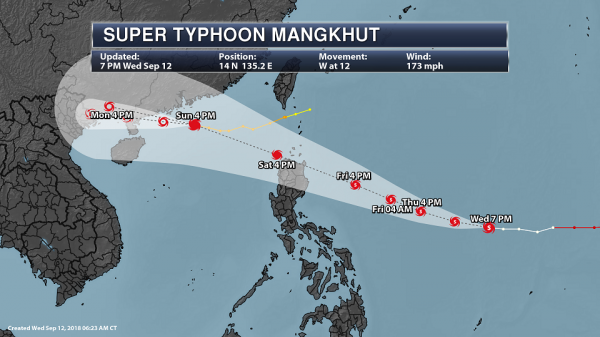 Super Typhoon Mangkhut could have impacts on southeastern Asia into the weekend. Hurricane Florence As Of Wednesday Morning. Florence remains a major hurricane across the western Atlantic Wednesday morning, with a very distinct eye in satellite images. As of the 8 AM ASTadvisory update from the National Hurricane Center, Florence was located 530 miles southeast of Cape Fear, NC, and moving to the west-northwest at 17 mph. 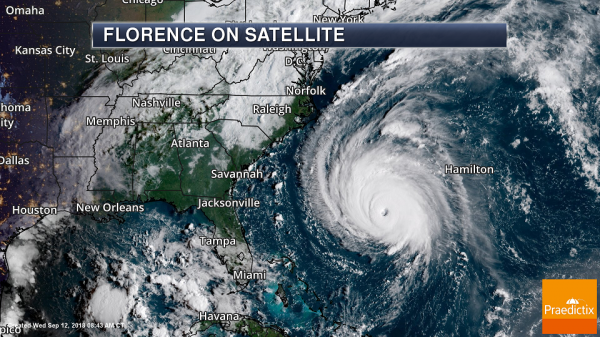 Florence had winds of 130 mph with hurricane-force winds (74mph+) extending outward up to 70 miles from the center of the storm, and tropical-storm-force winds (39-73 mph) extending out 175 miles from the center. Forecast Track. 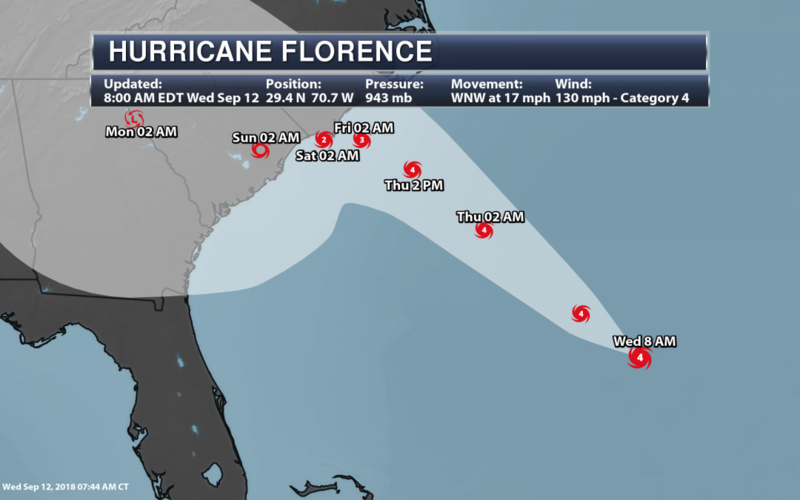 Florence will continue to track in a northwestward direction over the next 36 hours. During this time some fluctuations in strength are expected, but Florence should remain a powerful major hurricane into Friday. 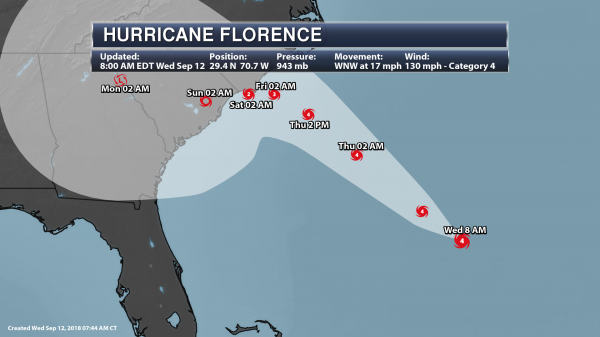 What concerns us this morning is that more models are showing Florence dramatically slowing down in forward speed near the coast Friday, with slow movement to the south before finally making landfall this weekend across the Carolinas or Georgia. This would be the worst-case scenario for areas along the coast, prolonging the damaging wind threat across parts of the region as well as life-threatening storm surge and heavy rain/flash flooding. The National Hurricane Center notes that their forecast path is currently north of the model consensus, and may have to be adjusted southward in future updates. Facilities along the East Coast – especially across the Carolinas and Mid-Atlantic – should make sure contingency/hurricane plans are rushed to completion. Conditions are likely to worsen across this region throughout Thursday. Tropical Alerts. Due to the expected wind impacts of Florence on the Mid-Atlantic, Tropical Storm and Hurricane Watches and Warnings have been issued. Hurricane Warnings are in effect from Myrtle Beach (SC), Wilmington, Jacksonville, New Bern, and Greenville (NC). Hurricane Watches are in effect for Lumberton and Goldsboro (NC), as well as Charleston, SC. Tropical Storm Warnings are in effect for Elizabeth City, NC. 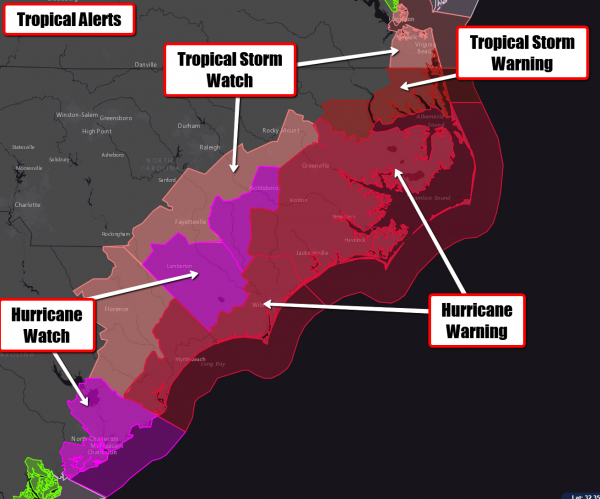 Tropical Storm Watches are in effect for Norfolk (VA), as well as Fayetteville (NC) and Florence (SC). Warnings indicate that either hurricane-force winds (74+ mph) or tropical-storm-force winds (39-73 mph) are expected within 36 hours. Watches means those conditions are possible within 48 hours. Potential Earliest Tropical Storm Force Wind. 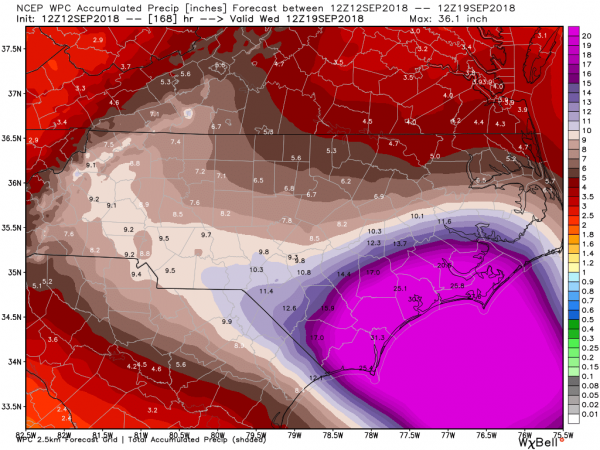 Tropical-storm-force winds will be possible starting tomorrow across parts of the Carolinas, with stronger winds following Thursday Night and Friday(especially in coastal areas). Preparations across this region should be rushed to completion today before stronger winds and outer rain bands tomorrow make any last minute preparations tougher to complete. Hurricane-Force Winds Expected. As Florence approaches the coast and eventually makes landfall, very dangerous hurricane-force winds are expected, especially near and along the coast. Winds will start to increase Thursday and Thursday Night, potentially reaching their peak across the region Friday. 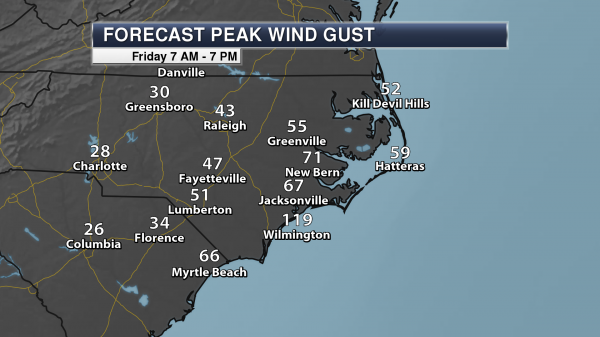 Throughout the day Friday, wind gusts over 100 mph will be possible for areas like Wilmington, NC. These winds will easily knock out power and down trees across the region. Power Outage Potential. The Guikema Research Group at the University of Michigan is forecasting the potential power outage numbers across the region based off the National Hurricane Center official track and intensity forecast. 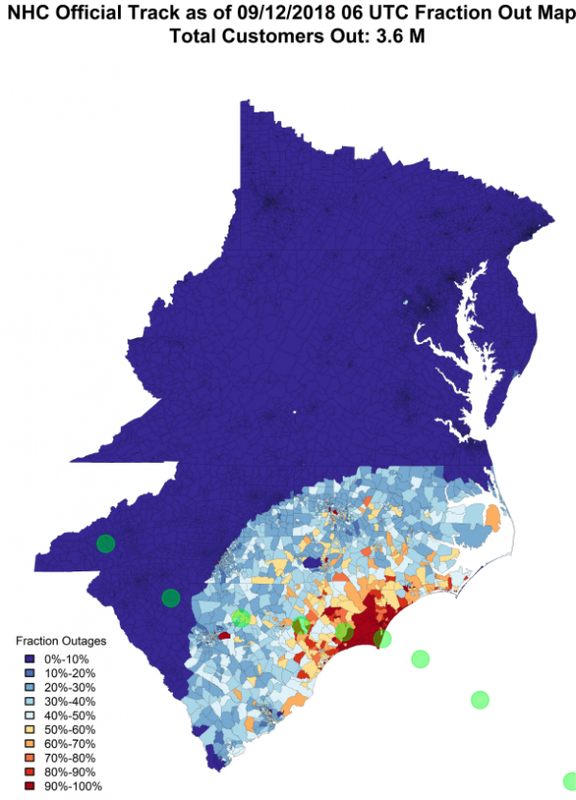 Their model is estimating 3.6 million without power due to this system across North and South Carolina, with the greatest concentration of outage in and around the area where Florence makes landfall. 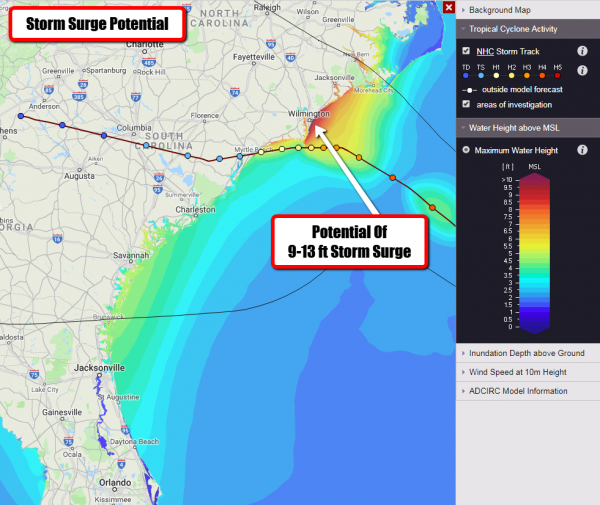 Storm Surge Potential. 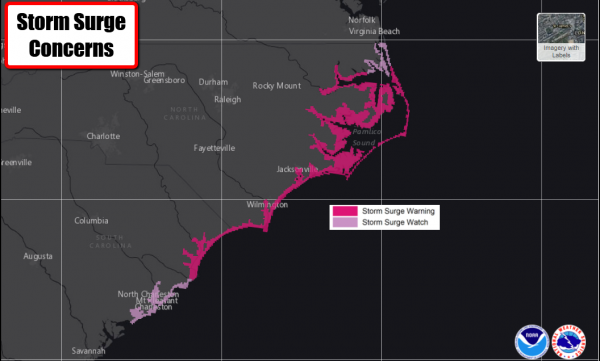 A destructive and life-threatening storm surge can be expected as Florence approaches coastal areas of North and South Carolina. In some areas particularly along the North Carolina coast near Wilmington, the storm surge could reach 9-13 feet above normally dry land. With Florence slowing down and hovering around the coast, these high water levels could occur across several high tides. Flash Flood Watches. 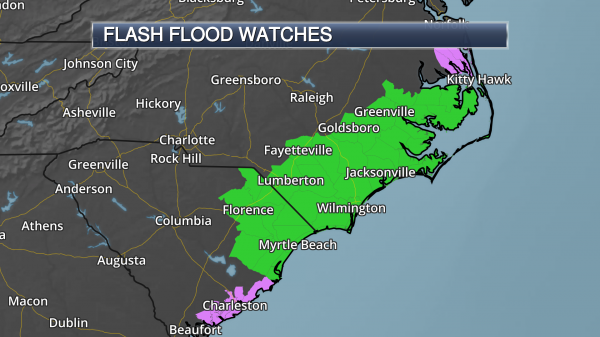 With very heavy rain on the way, Flash Flood Watches have been issued across parts of North and South Carolina from Thursday through Saturday. “Storm Of A Lifetime.” Florence is not a storm to take lightly across the region as we head throughout the next several days. 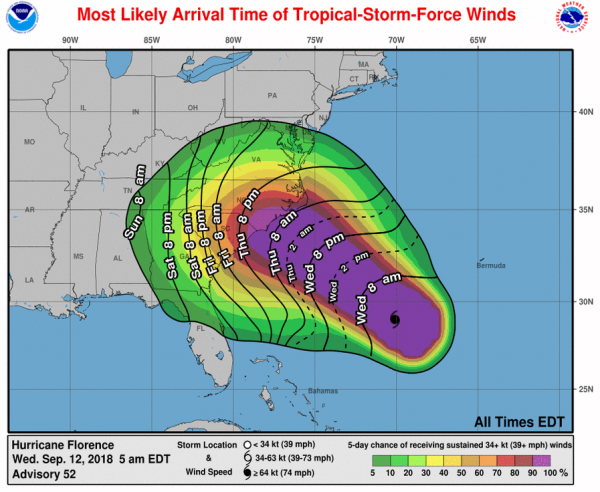 With the potential of hurricane-force winds, life-threatening storm surge, and catastrophic flooding, the National Weather Service in Wilmington, NC, was using bold verbiage in their forecast discussion last night – calling this “the storm of a lifetime for portions of the Carolina coast.” Once again today is the day to finish up preparations across parts of the Carolinas before the outer fringes of Florence bring gustier winds and showers to the region tomorrow. Watching The Gulf Of Mexico. While showers and clouds have decreased over the past several hours in association with an area of concern across the south-central Gulf of Mexico, conditions are expected to become more favorable for development over the next day or two. Due to this, a tropical depression could form in the Gulf of Mexico by the end of the week before this system reaches the western Gulf Coast. Facilities across portions of northeastern Mexico, Texas, and Louisiana should continue to monitor this situation over the next few days. Whether or not this system forms into something tropical, heavy rain and gusty winds are possible. As of Wednesday morning, this area had a 60% chance of forming into a tropical system in the next two days. Rainfall of 5–10”, with isolated 15” amounts, that could lead to flash flooding. Flash Flood Watches are in effect across the entire state through late Thursday Night. Tropical storm force winds across Maui County and the Big Island tonight into Wednesday, and across Oahu starting early Wednesday. Large swells resulting in high surf, especially across east facing shores. Tracking Mangkhut. Further out into the western Pacific, we continue to track Super Typhoon Mangkhut. As of the 6 PM local time update, Mangkhut was moving to the west at 12 mph with 175 mph winds. A turn toward the west-northwest can be expected soon, with the storm continuing in that direction for several days. This path would bring Mangkhut toward Southeast Asia late in the week into the weekend. Right now the system looks to pass south of Tawain, more impacting parts of the northern Philippines late Friday into Saturday.